Like a lot of gamers out there, I take a lot of pride in my skill at video games—perhaps too much. At this point in my life, I’ve been playing video games for close to two-and-a-half decades. Somewhere in my late teens, I decided that I had to master the games I played, not just play them. Then that idea transformed into not only mastering them but also doing so on at least the “hard” difficulty. The advent of achievements and trophies took this drive to a whole other level. My “gamer pride” would allow nothing less. However, in my mid-twenties, I decided that the stress of beating every game on hard far outweighed the sense of accomplishment—not to mention the fun of the game. And if I wasn’t having fun, why was I still playing? Who was I trying to impress? So from that point on, I’ve tended to play games on their default difficulty (although occasionally I still ratchet it up to hard if I want more of a challenge). What I never expected to run into was a game that absolutely destroyed me on the normal difficulty. Enter Shin Megami Tensei IV. 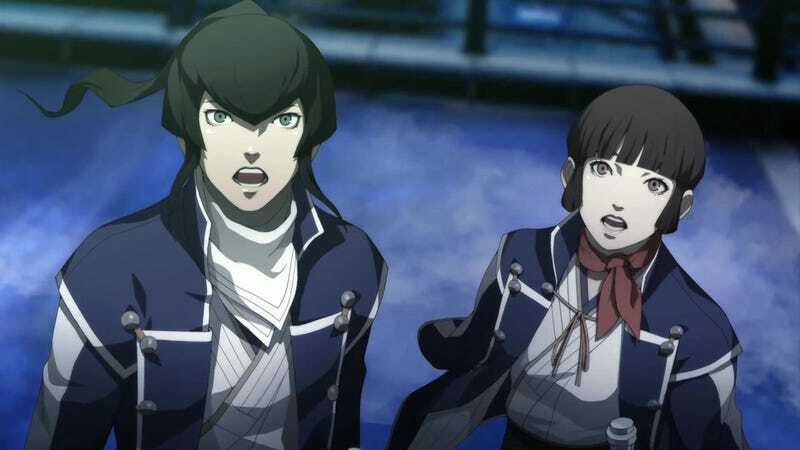 Going into Shin Megami Tensei IV, I had already played spinoff title Persona 3 and its sequel FES, so I was relatively sure I knew what to expect in a general sense. At first, all seemed simple enough. I entered the tutorial dungeon, followed the instructions and captured my first demon partner—which you do through mid-battle conversation trees. My first real objective seemed simple enough: capture two more monsters to get a full party. So I entered a battle and tried to charm a monster. It asked for a healing item—of which I had only one. I gave it. It asked for about a third of my money. I gave it. It asked for some of my HP. I let it bite me. It asked for some MP and I let it have that also. Then the demon laughed at me, called me stupid, and bit me in the face killing me. One turn later, my pet demon was dead as well. My second battle and already a game over. Shin Megami Tensei IV then went into a cutscene where a white-haired demon began to mock me for dying. Then, he offered to bring me back to life for over half of what little money I had left. I told him to screw off and so he sent me to the game over screen. Over the course of the next hour, I was saving and loading constantly. I would enter a battle, try to charm the monster (and as the correct answers to the conversation randomize each time), get rejected, and often barely make it through the battle. On those several times when I didn’t survive, I just quit to the home screen and rebooted the game rather than deal with that long, mocking cutscene. Eventually, I captured two more demons and thought I would finally be able to progress in the game. I was soon disappointed. Nearly every demon I encountered could kill any of my party simply by attacking them twice in one turn. I was completely powerless to stop it. Even as I leveled up, death by random battle was still a common occurrence. And, as money is only gainable through in-battle conversation with demons or as a reward for quests, there was no simple way to get better gear—not that gear was all that helpful anyway. By the time I reached the third boss in the game—a boss who was actually part of an optional quest—I had spent five hours on the game and was barely past the tutorial plot-wise. Dreading the fight, I entered the battle. The boss attacked every member of my party at once—and then did it three more times for good measure. It killed us all on its first turn despite everyone being at full life when its turn started. I had two options. One: spend hours catching and fusing (and then leveling up) demons that were strong against his attacks and could exploit his elemental weakness. Or two: switch the game to easy mode and continue on with the story. At this point, I was so tired and frustrated I put my “gamer pride” aside and decided that the game had won: I would change the difficulty. But just like everything in Shin Megami Tensei IV, even changing the difficulty didn’t come without a price. No, to play on easy mode, Shin Megami Tensei IV requires you to humiliate yourself. To unlock easy mode, you must die, watch the game mock you via cutscene, then pay about half your cash. Then you must die again and get another verbal lashing that ends with easy mode being unlocked. Since switching over to easy, I’ve been enjoying the game much more—especially as I progress through the story. I only wish now I would have sucked it up and switched to easy mode at the first sign of trouble. But here’s the real kicker: I still die from time to time. Even on easy, Shin Megami Tensei IV is still a difficult JRPG. Shin Megami Tensei IV was released on May 23, 2013, for the Nintendo 3DS in Japan. It will be released in North America on July 16, 2013.